Please meet another of our Paralegals, Bobbie Jo Keller. Bobbie Jo has been the Medical Records Clerk since 2014. Bobbie Jo works on personal injury, lead paint, and products liability matters. She also assists with the gathering and analysis of treatment, employment and/or educational records; marshaling the records for Independent Medical Exams and communicating with the provider and/or agency; drafting discovery and pleadings; communicating with witnesses prior to, and during, depositions and trials; preparation of file analysis/strategy evaluations; trial preparation to include preparation of trial notebooks, document management, and assisting the handling attorney during the trial. Bobbie Jo received her Bachelor of Science Degree in Forensic Science/Crime Scene Investigation from Hilbert College in 2008. 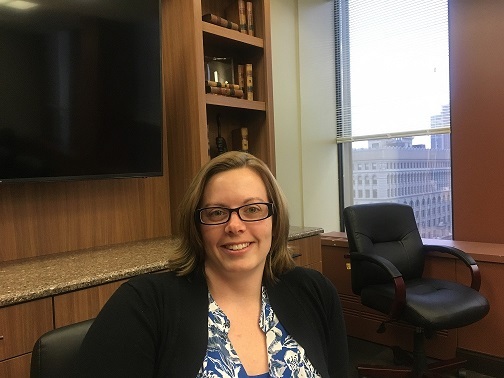 She is also a member of the Western New York Paralegal Association. 1. Bobbie Jo is a Wyoming County resident and thus, has a 1 hour daily commute. She endures the lengthy drive because she loves the country living of Wyoming County and refuses to move closer to the city. 2. She has been married for 6 years and is the proud mom of a 2 ½ year old son. She has a boxer named Dexter, and 2 cats, Rylie and Luckie. 3. Her favorite music is county music! 4. She loves watching tractor pulling and participating in her tractor pulling club, Eagle Garden Tractor Pullers Association. 5. Bobbie Jo’s favorite place she has visited is the Arenal Volcano in Costa Rica, and would love to return there someday. 6. She would also love to visit Paris, France. 7. Her favorite foods are Pizza and Ice Cream!!! 9. Bobbie Jo loves monkeys! 10. When she was younger, she wanted to be an astronomer and work for NASA. She still loves astronomy. Her favorite thing to do in the summer is to sit by a campfire and look at the stars and constellations!